When it comes to city breaks, Cologne may not be at the top of your list, but its unassuming charm and modesty only adds to the city’s allure. The fact is, Cologne is packed with myriad attractions, from spectacular gothic architecture to art, chocolate and sport. These many attractions combine with the city’s cool vibe, making it one of Germany’s best-kept secrets. Those in the know delight in the many things to do in Cologne, revelling in the knowledge that they have been part of something special; that they are members of a select group of people who have discovered this city of fun, art and culture. The twin towers of Cologne’s Cathedral preside majestically over the city, dominating its landscape and drawing tourists to the city. In fact, Kölner Dom is Germany’s largest cathedral and often rated to be the country’s most popular tourist attraction. Until the Eiffel Tower was built, the cathedral was the tallest building in Europe. Despite losing that particular accolade, it is still spectacular, and an essential thing to do in Cologne. First, walk around the cathedral, so that you can take in the sheer scale of the building; the apparently delicate towers and buttresses soaring impossibly high, like spires of spun sugar. On entering the cathedral, you will be struck by the spaciousness and soft light of the interior, illuminated beautifully by a kaleidoscope of colours cast by the stained-glass windows, including a contemporary addition by Gerhard Richter, which features 72 colours and 11,500 squares. The cathedral is packed with art, icons and an array of treasures, such as the crowning glory of which is the sarcophagus of The Three Kings. The gilded, jewel-studded tomb is said to hold the remains of Gaspar, Balthasar, and Melchior, the Magi who followed the North Star to find the baby Jesus. Once you have had your fill of the many treasures held within the cathedral, head to the base of the south tower, where you can climb the 533 steps up the top of the steeple. The view is, of course, spectacular, and the knowledge that you are at the top of the steeple that, not so long ago, looked so fragile, will fill you with wonder. The River Rhine meanders through Cologne just as veins wind through the human body. The river is the city’s life force, bringing goods, providing transport routes and, of course, adding infinite beauty to the city. Today, the Rhine continues to be used for industrial purposes, but it is also the perfect place to discover the incredible architecture of Cologne, direct from the city’s heart. Sail through Cologne and admire the surrounding buildings, before taking in historic towns and gothic castles perched atop grassy knolls. Take in the ancient fortifications dotted along the waterfront, and learn of their strategic importance and the valuable role they had to play in the city’s history. As you glide past the University, the Chocolate Museum and the array of dazzling landmarks, you can make a mental list of attractions that you would like to take a closer look at on your trip. There are a range of boat trips, from day-long trips that include stops at popular attractions, to night cruises, where you can dine in style and absorb the dazzling beauty of the city at night; with prices from as little as €10, a boat trip on the Rhine is a must. Fancy a taste of chocolate heaven? Then pop to the Schokoladenmuseum, where you can pay homage to the craft of chocolate-making. This tantalising museum is a modern tribute to all things chocolate. Discover the rich history of the sweet treat, from its Aztec roots, where it was known as the elixir of the gods, through cocoa-growing, and chocolate production. Follow the cocoa bean from tree to chocolate box, walk the factory floor and stop off at a chocolate fountain for a sugar hit. Upstairs, you can explore chocolate moulds, jars and recipes from across the centuries, while the shop on the ground floor is laden with a vast array of mouth-watering chocolates. Choose from normal entry, or go with a group for a guided tour. One thing is for sure, no matter which chocolate you prefer, you are guaranteed to learn something that you didn’t know about everyone’s favourite treat. Paris’s Love Lock bridge became more famous than ever in the last couple of years, as officials are constantly battling to keep the Ponts des Arts and Pont de l’Archeveche free of padlocks after the estimated 45 tonnes of locks were thought to be compromising the bridges’ stability. 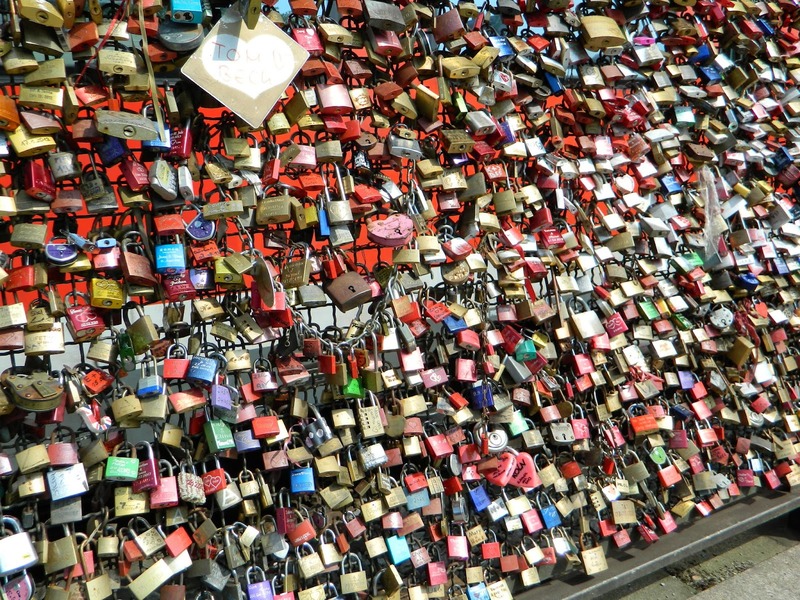 Cologne has its own love lock bridge, and there is nobody preventing displays of affection here! Spanning majestically across the Rhine, the Hohenzollern bridge was originally created in 1911 and was the pride of the region, with four railway tracks and a dual-lane road. The bridge was destroyed in 1945 by retreating Germans; in 1948, partial repairs took place and in 1959 a complete renovation restored the bridge to its former glory. In the mid-eighties, a further renovation saw the addition of 2 more rail tracks. Up to 1200 trains pass over the bridge every day, not to mention countless pedestrians, some of whom are simply crossing from one side of the river to the other, while others come to enjoy the spectacular view or to join hundreds of thousands of others and to seal their love with a lock. If you want to plan a memorable trip to Cologne, check here for our best deals. For more inspiration, offers and information, don’t forget to follow us on Facebook, Twitter, Pinterest, and Google+. How traveling will change you?